Team USA’s Amanda Sobhy and Sabrina Sobhy earned women’s doubles gold medals Wednesday afternoon, before Amanda defeated Sabrina in the women’s individual final Wednesday night to earn Team USA two gold medals at the 2018 Pan American Championships in the Cayman Islands. 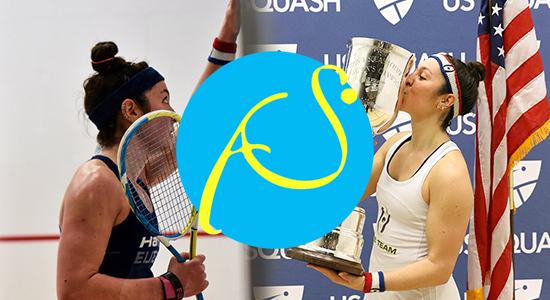 Wednesday saw the culmination of both the men’s and women’s individual draws and men’s, women’s and mixed doubles draws with five gold medals on offer. The Sobhy sisters were two of the busiest players of the day with a total of four matches to play, including both individual and doubles semifinals in the morning followed by the finals in the afternoon and evening. Despite the physically taxing schedule, the sisters went the distance to earn Team USA top honors in both draws. The U.S. men earned three bronze medals in the individual and doubles semifinals. Todd Harrity and Chris Hanson first teamed up on the doubles court where they lost out to Mexico’s two seeds and gold medalists Alfredo Avila & Cesar Salazar. Harrity then fell in three games against Peru’s gold medalist Diego Elias, while Jamaica’s Chris Binnie edged Hanson in a close five games. With no bronze medal match on offer, both players collected bronze. In the women’s doubles draw, the Sobhy sisters pulled off a perfect gold medal run without dropping a game as they defeated Canada’s Nikole Todd & Samantha Cornett in the semifinals and Colombia’s Laura & Maria Tovar in the final. Amanda Sobhy pulled off another perfect gold medal run in the individual draw without dropping a game. While Amanda was expected to reach the final as the top seed, Sabrina’s silver medal run as a 9/16 seed included major upsets over Canada’s 5/8 seed Hollie Naughton in the quarterfinals and Canada’s two seed Samantha Cornett in the semifinals. In the final, it was the elder sister who emerged victorious 11-3, 11-8, 11-8. The gold medal marks Sobhy’s third career Pan Ams individual title, adding to her 2013 and 2015 titles. Three years ago at the quadrennial Pan American Games in Toronto, Sobhy made history by becoming the first squash player to win three gold medals in the same year. The twenty-five-year-old is targeting another triumvirate in the Caymans. View all individual and doubles results here. The individual and doubles results earned both the U.S. men and women top seeds going into the final team competitions. Both teams enjoy a first round bye Thursday morning with the men set for the first action Thursday afternoon at 3:45pm local time, 4:45pm ET as the women enjoy an off day. The men are seeded to face 3/4 seeds Mexico in the semifinals and a potential final against two seeds Canada. The women could face 3/4 seeds Colombia in Friday’s semifinals and two seeds Canada in Saturday’s final. The team events determine qualification and seeding for the 2019 Pan American Games in Lima, Peru, next summer. The U.S. women automatically qualify with a first-round bye, while the men will aim to position themselves well ahead of the Pan Am Games with a strong end to the week. Team USA entered the event with an emphasis on improving results in the doubles events, which the team fulfilled by claiming two medals across the three competitions. View team draws and results here. All medal ceremonies will take place Saturday following the completion of the team competitions.